In 241 BC the Romans conquered Sicily in the course of their first war against Carthage. The possession of this island at the center of the Mediterranean Sea led to the first contacts with the Egyptian Empire, which was ruled by a Greek dynasty, the Lagides, after Lago a general of Alexander the Great. The Lagides are more often referred to as the Ptolemies, Ptolemy being the recurring name of their Pharaohs. The rise of Rome in the Mediterranean did not lead to confrontation with Egypt, although the internal quarrels among the members of the Egyptian dynasty gave Rome some say in the internal matters of Egypt. In 49 BC Pompey, after his defeat at Pharsalus, sought refuge in Alexandria, then the capital of Egypt, but the Pharaoh Ptolemy XIII assassinated him to ingratiate himself with Caesar. Caesar however was not pleased with the killing of his rival and took the side of Cleopatra, both sister and wife of Ptolemy in a dynastic quarrel between the two. A Roman army defeated Ptolemy in 47 BC and Cleopatra ascended the throne of Egypt. The Roman general fell in love at first sight with the Egyptian Queen and in a way it was the same for the two countries. With the exception of Greece no other country had greater influence over the Romans and the Egyptian gods became key members of the Roman pantheon. The official iconography of the Roman Emperor, strictly defined by Augustus admitted only one exception so that the Emperor could be portrayed as an Egyptian Pharaoh to underline the continuity between the pharaohs and the emperors. In this context Augustus after having defeated Antony and Cleopatra and conquered Egypt in 30 BC brought from Heliopolis to Rome the obelisks dedicated to the Pharaohs Rameses II and Psammetichus II. 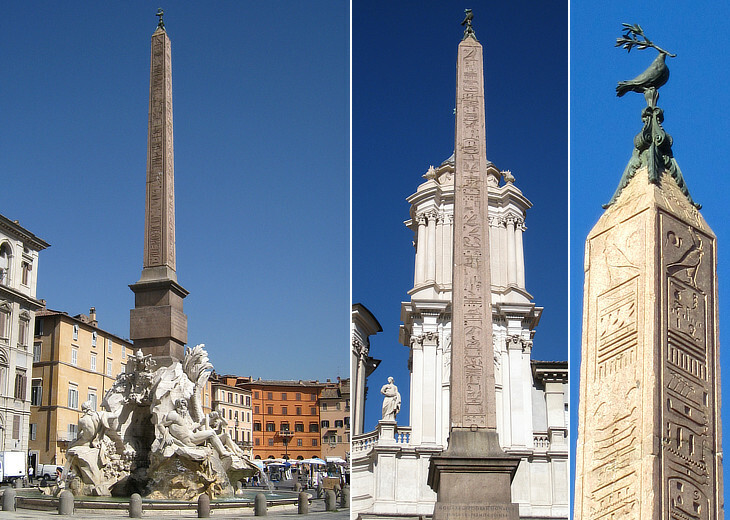 Other obelisks came from Egypt or were made in Rome in the next three centuries; thirteen of them can still be seen in the streets of Rome. All the obelisks are no longer on the site where they were erected by the Roman Emperors. In the XVIth century most of them were broken into pieces and they were just another component of the picturesque view of the Roman ruins. They were saved by Pope Sixtus V (1585-90) who used them as focal points for some of the new streets he opened as part of his plan of urban development. 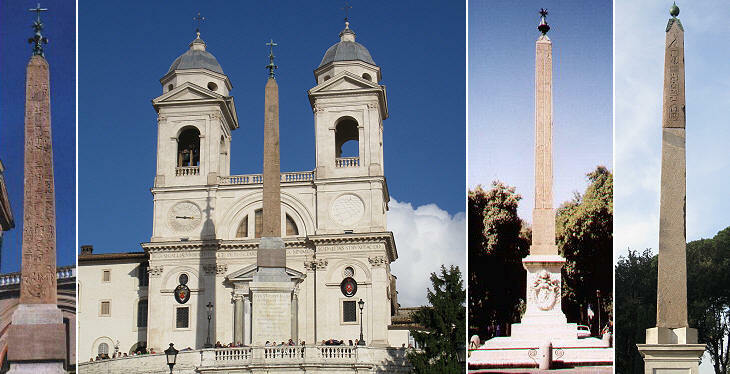 Several obelisks were repaired, turned from pagan to Christian monuments by the addition of new inscriptions, topped with a cross and with the heraldic symbols of the pope and eventually moved to the center of a piazza or in front of a basilica. The obelisk was initially erected by the Pharaoh Rameses II in Heliopolis. In 30 BC Augustus brought it to Rome where it was put at the center of Circus Maximus and dedicated to the Sun (in line with its original dedication). It fell during the wars between the Byzantines and the Goths for the control of Rome in the VIth century AD and it was covered by debris. 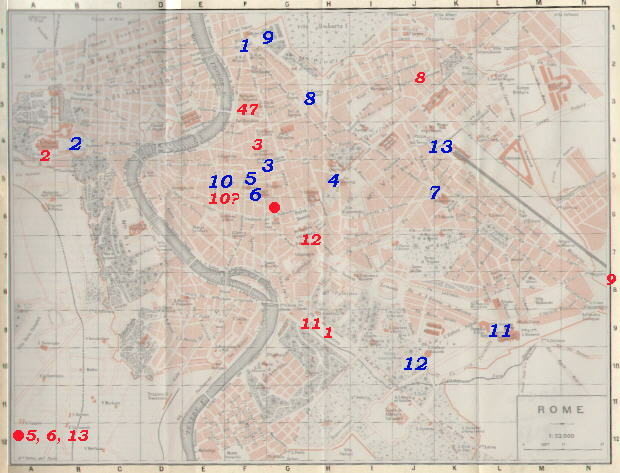 In 1587 the area was excavated and the obelisk was repaired (it was slightly shortened) and moved in 1589 to Piazza del Popolo at a point where three streets (Via di Ripetta, Via del Corso and Via del Babbuino) converge to form il Tridente di Roma. It is topped by the mountains and the star of Sixtus V.
The obelisk was originally erected by Psammetichus II in the 7th century BC and then brought to Rome by Augustus who placed it as a sundial in a vast square (Horologium Divi Augusti) where its shadow indicated the hours of the day and the days of the year. The obelisk was found split in five pieces in 1748 and it was eventually repaired and erected in front of Palazzo di Montecitorio. The reliefs are partially lost. Pope Pius VI put on top of the obelisk a symbol of his coat of arms; at noon a sunbeam goes through an opening in the globe: it ends on a series of marks on the floor showing various dates. This is the tallest obelisk of Rome and also the last to be brought from Egypt. Both Augustus and Constantine considered bringing it to Rome from Thebes, where it had been erected by the Pharaoh Thothmes IV. In AD 357 Emperor Constantius II was able to arrange its transportation by using a specially built ship. It was located in the Circus Maximus, where it was found broken into three pieces in 1587. It was moved to Piazza S. Giovanni in Laterano in 1588 by Sixtus V who wanted its top to be decorated with the whole array of his heraldic symbols: not only the three mountains with the star, but also the lion holding the pears. It is one of the best preserved obelisks, with very fine hieroglyphs. 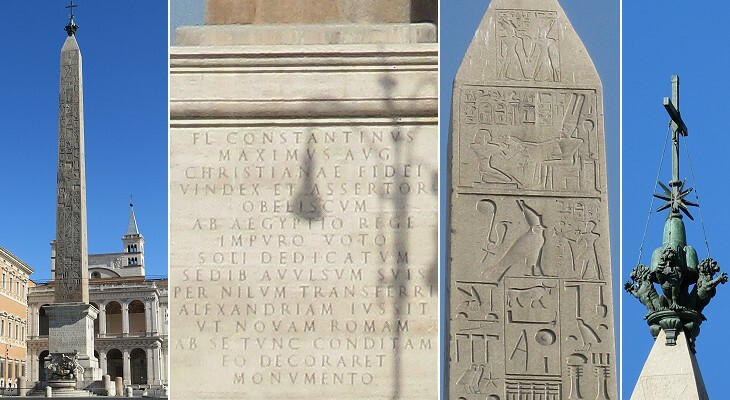 The obelisk was erected in Alexandria by the Romans in the Ist century BC and it was dedicated to Augustus. It does not have any inscription in hieroglyphs. It was moved to Rome by Caligula who placed it in the Circus he had built in the Vatican (the Circus was later on named after Nero). The obelisk never fell and this fact in the Middle Ages was attributed to the reputation of Nero as a sorcerer. It was topped by a (lost) bronze globe which was thought to contain the ashes of Caesar, Augustus and Tiberius. In 1586 Sixtus V ordered Domenico Fontana to relocate it in front of St. Peter's. So the Obelisk was the first element of the Piazza. 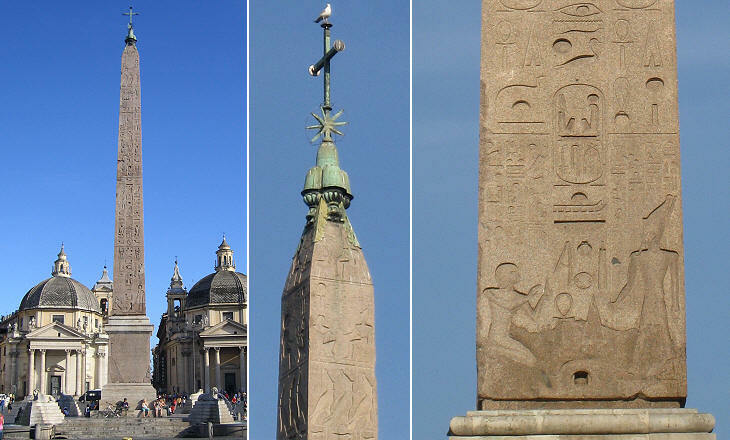 The top of the obelisk is decorated with the mountains and the star of Sixtus V.
The obelisks were erected in Rome at the entrance to the Mausoleo di Augusto (they do not have hieroglyphs). Augustus had visited the tomb of Alexander the Great in Alexandria and he decided to build his family tomb taking into account some aspects of the tomb of Alexander. Both obelisks fell into pieces and as the area was often flooded they disappeared into the ground. In 1519 the opening of Via di Ripetta led to the discovery of one of them. It was broken into four pieces which were assembled near the church of S. Rocco. Sixtus V (1585-90) had the obelisk repaired and placed (1587) at the end of Strada Felice a new street he had opened to reach S. Maria Maggiore. The top of the obelisk is decorated with the mountains and the star of Sixtus V.
In 1781 the second obelisk was discovered; it was broken into three pieces and it was repaired and placed (1786) by Pius VI in Piazza del Quirinale between two existing colossal statues. Its position was slightly modified in 1818. 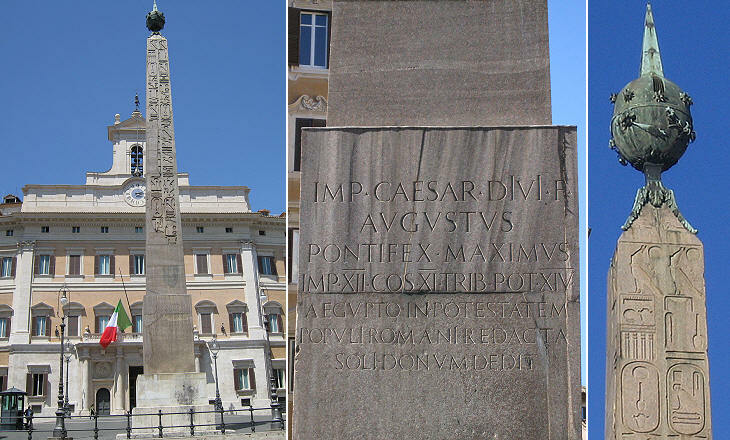 The obelisk was erected by Emperor Domitian after the fire which had destroyed a large part of Rome in 80 AD and most likely it decorated the Isaeum/Serapeum Campense a large complex of Temples dedicated to the Egyptian gods Isis (hence Isaeum) and Serapis (hence Serapeum) in Campus Martius. Its hieroglyphs are related to the cult of these gods. In AD 309 Maxentius moved the obelisk to the circus built in honour of his son Romulus near Via Appia. The obelisk fell in the VIth century and it broke into five pieces. 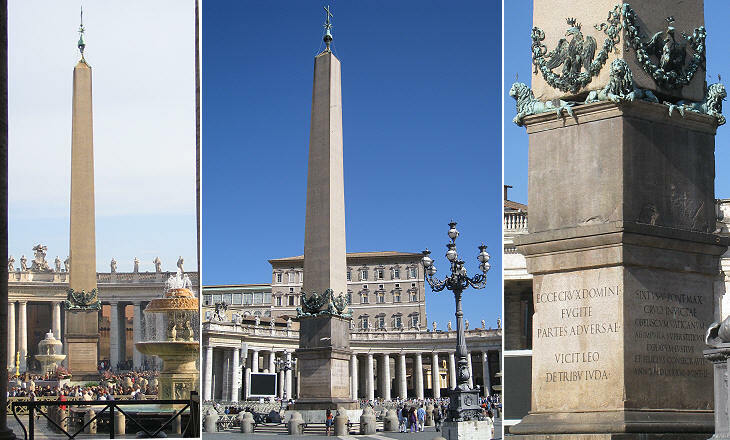 In 1648 the obelisk was repaired and in 1649 it was erected on top of the fountain designed by Gian Lorenzo Bernini to celebrate the glory of Pope Innocent X (1644-55). Bernini had not been invited to submit a project for the fountain, as the Pope reproached him for his too close connection with his predecessor Pope Urban VIII and for the technical failure of his attempt to erect St Peter's bell towers. Bernini found a way to have a model of the fountain seen by the Pope and he immediately was given the commission. The top of the obelisk is decorated with the dove of Innocent X. The Isaeum/Serapeum Campense covered a large area between the Pantheon and Via Flaminia (today Via del Corso) and it was embellished with several small size obelisks all coming from Egypt. 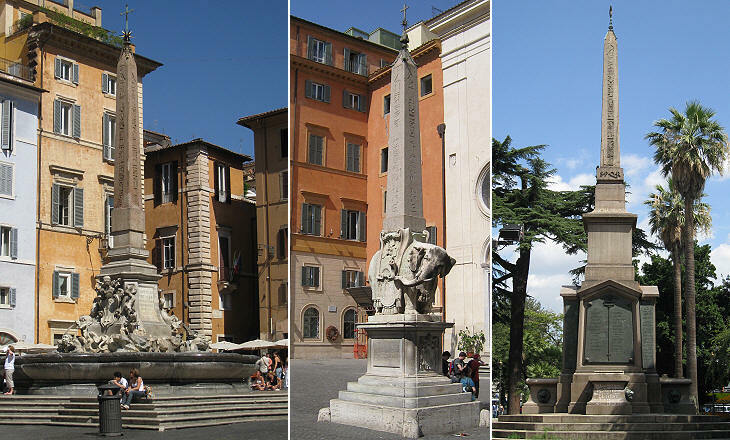 The obelisk in Piazza della Rotonda was originally erected in Heliopolis by Rameses II. It was located near S. Macuto and referred to as Guglia di S. Macuto in several descriptions of Rome. In 1711 Pope Clement XI (1700-21) moved it to the center of the already existing fountain in front of la Rotonda, the Pantheon. The top of the obelisk is decorated with the mountains and the star of Clement XI. The obelisk in Piazza di S. Maria sopra Minerva was found in 1665 in the cloister of the church. It was originally erected in Sais, a town in Lower Egypt, by the Pharaoh Apries. In 1667 Gian Lorenzo Bernini erected the small obelisk on top of an elephant (a work by Ercole Ferrata). Here you see it from the back; for a frontal view see my page on Alexander VII (1655-67) the pope whose heraldic symbols and coats of arms decorate several parts of the monument. The obelisk in Piazza di Termini was found in 1883 near S. Ignazio. It was originally erected in Heliopolis by Rameses II. In 1887 it became a little monument to the 500 Italians who had fallen at Dogali in Ethiopia and it was placed in front of the Termini Railway Station. It is now in the gardens between the Railway Station and Piazza della Repubblica. The star on the top of the obelisk is a symbol of Italy. Other obelisks of Isaeum/Serapeum Campense are in the Boboli Gardens in Florence and in Urbino. The obelisk in front of SS. Trinità dei Monti was initially erected in a private residence called Horti Sallustiani after the name of its first owner, the Latin historian Sallustius, a very wealthy man. The Horti Sallustiani covered a large area near Porta Pinciana and Porta Salara, which later on became part of Villa Ludovisi. 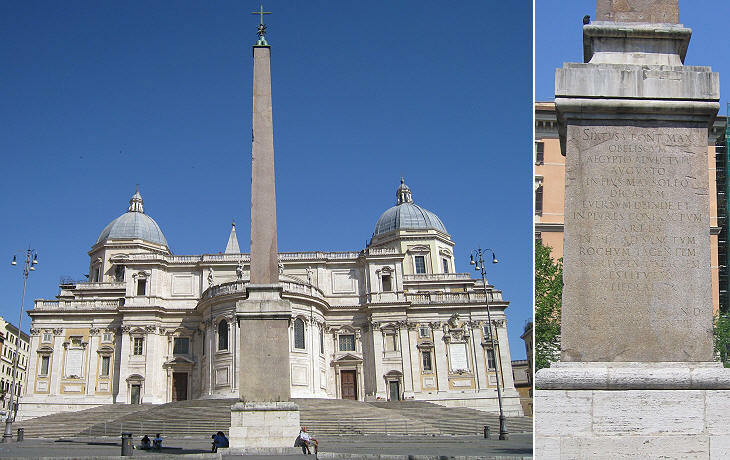 It is a small scale copy of the obelisk of Rameses II, now in Piazza del Popolo and it was made in Rome. It was moved by Pius VI in 1789 to its current location. The top of the obelisk shows a lily and a star which are heraldic symbols of Pius VI. The obelisk in Piazzale del Pincio was erected by Emperor Hadrian (AD 117-138) in memory of his favourite Antinous. The obelisk was found in the XVIth century near Porta Maggiore and in 1633 it was relocated by Pope Urban VIII to his palace. 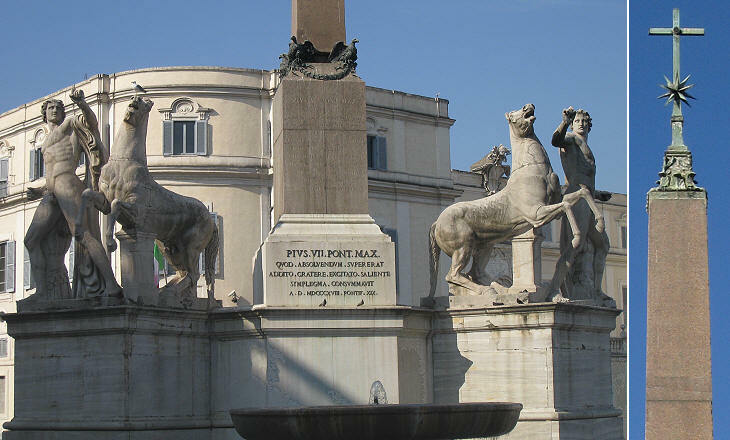 In 1822 Pope Pius VII moved the obelisk to Piazzale del Pincio. The small obelisk in Villa Celimontana was presented in 1582 by the Senate of Rome to Ciriaco Mattei, who placed it in his Villa on the Celio. At that time the obelisk was at the foot of the steps leading to S. Maria in Aracoeli, but most likely it had been moved there from Isaeum Campense. The image used as a background for this page shows the tip of the obelisk. See the obelisk of Thutmosi III in Constantinople. 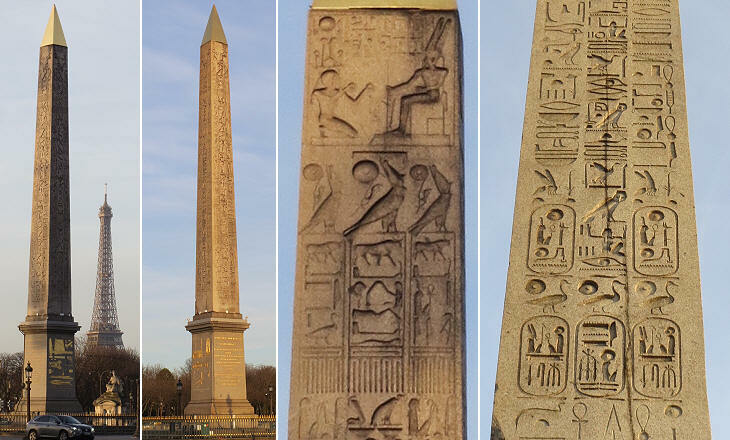 See another obelisk of Thutmosi III once in Heliopolis, then in Alexandria and today in London (click here to see its twin in Central Park in New York - external link). See (below) the (slightly leaning) obelisk of Rameses II in Place de la Concorde in Paris, a gift made by Muhammad Ali Pacha, Khedivè of Egypt to King Louis-Philippe of France in 1833.